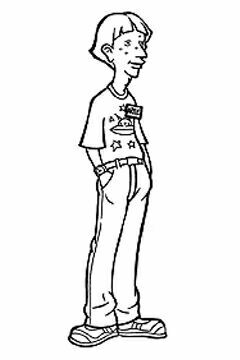 In the "Before They Were Daria Stars" flipbook feature, Artie's character designs can be found; there are several of them, clearly dating back to the early days of the show (he'd clearly been planned to be used for a long time). They're also on the Complete Animated Series DVD but oddly, they're down as Upchuck's designs. Artie in the series is portrayed as a nearly-psychotic, barely functioning UFO nut. In his second appearance, it's made clear his obsession prevents him from holding down a job: he's been repeatedly fired, something he blames on the aliens but is more because he does things like spend hours when on-the-job telling people about UFOs. It is sometimes assumed that he is a student at Lawndale High, though in "Tree Grows" it turns out he isn't. His UFO mythology is even strange by those standards. Among other things, he believes that aliens are stealing humans' skin, because the skin remembers everything you see, taste, or touch. He also believes that the aliens who kidnap him periodically also press his pants and do "a nice job." He's appeared twice on Sick, Sad World, talking about his abduction. In the second one, he accused Daria and Jane of being aliens, who "used me". When he ran into Daria and Jane again in "A Tree Grows In Lawndale", he recognised them as "familiar" but couldn't pinpoint where from, though he thought they went to Lawndale. In "Daria's Inferno", he's an obstacle in the second level, The Mall: there, he's working as an usher at the mall's cinema. He introduced a version of the Daria website that focused on minor characters: " I'm one of the many characters on the animated series Daria. Unlike the unpopulated planet of Zorn, the world of Daria is overrun with a variety of lifeforms particular to its craggy surface. These often unappreciated beings (like me!) are secretly plotting to overthrow the so-called "stars" of the series and establish a new society made up of polygamous "pods" joined together in an interstellar coalition of cosmic unity. At least that's my plan." Artie's numerous appearances in fanfic have been extremely consistent to type. He is usually depicted as a pizza-delivery guy or pizza waiter, but he sometimes has other jobs (paperboy, subpoena server, babysitter, etc. ), having lost his previous employment for predictable reasons. His appearances are brief, minor, and humorous, with a few notable exceptions. It is not uncommon to see him interviewed on Sick, Sad World about his various alien encounters and abductions, with which he is perpetually obsessed. He seems delusional, but once in a while (in science-fiction tales) his wild claims about aliens turn out to be perfectly correct. He is present in the background of the John Lane series, The Look-Alike Series, the Driven Wild Universe, and many more besides. He also appears in several crossovers, being mentioned in passing even in a Doctor Who tale, Yui Daoren's "Doctor Who Gives a Damn." Typical examples of Artie's appearances in fanfic include the following, in no particular order. More unusual examples appear below. Artie's most atypical roles in fanfic are given below. 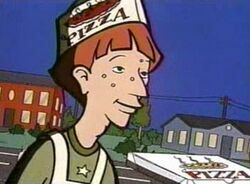 Artie reappears at Pizza King in "A Tree Grows in Lawndale"